Processed sugar gets a lot of attention these days because of its link to things like poor memory, depression, neurodegenerative disease and aging. What is this all about? Brain cells use glucose exclusively for energy and glucose is ubiquitous in a healthy diet that includes plenty of fruits and grains. Problems arise, however, when we consume much more added sugar in the form of high fructose corn syrup and sucrose in processed foods and soft drinks over a long period of time. 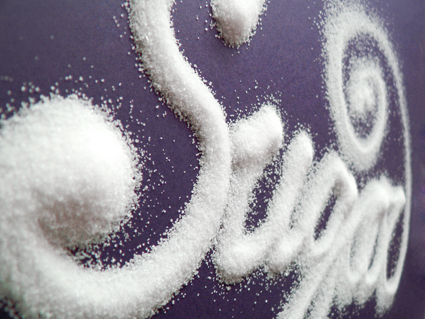 The Centers for Disease Control puts US consumption of added dietary sugar at 27.5 teaspoons a day, which translates to 440 calories, roughly one quarter of a typical diet (http://1.usa.gov/1BuGBZK). What is it about sugar and the brain? To answer this we need to discuss a little organic chemistry. The term glycation refers to the addition of sugar molecules to the amino acid groups of proteins. This begins a complicated series of reactions leading to advanced glycation end products (AGE). The production of these clusters of modified proteins is irreversible, and this is the important thing, the proteins no longer function and they accumulate in cells to form aggregates that do not dissolve. Such aggregates interfere with the basic activities of nerve cells and cause production of reactive oxygen species which further damage both proteins and DNA. These changes disrupt cellular metabolism, damage mitochondria, halt energy production, cause DNA damage and kill neurons. Over the long run, the production of AGE leads to neurodegenerative disorders such as Alzheimer’s, ALS and dementia and to depression (http://1.usa.gov/1zxmRFP). And there is more. The receptor protein for advanced gycation end products, a membrane protein called RAGE, initiates inflammatory immune responses on binding AGE that mediate changes in the cells that line capillaries in the brain, the endothelium. This disrupts the integrity of the blood-brain barrier making it leaky and allowing inappropriate entry of blood borne factors into the central nervous system. In turn, this leads to further cell damage due to production of reactive oxygen species and inappropriate activation of inflammatory immune responses in brain that are toxic to neurons (http://bit.ly/1usmPyA, http://bit.ly/1vb5XHI). In animal models, a diet rich in saturated fat and refined sugar, also interferes with brain structure and function by decreasing expression of hormones that control the growth of neurons. One of these is brain-derived neurotrophic factor (BDNF). A high sugar diet, maintained for 2 to 24 months in rats decreases the level of BDNF in the hippocampus, a structure in mammalian brain essential for learning and recall. This reduces spatial learning performance, synaptic function, and downstream pathways responsible for the action of BDNF on synaptic plasticity. These changes can all be traced to decreased expression of proteins that are critical to synapse function and signaling pathways required for learning, as well as pathways required for the growth of neurons. This is heavy stuff, but what it shows is that a maintained high sugar diet has dangerous effects on processes that are critical for nervous system function, especially to learning and memory (http://bit.ly/YJp1TK). Without BDNF, the brain does not form new memories and recall of stored memory is severely limited. Low levels of BDNF occur in dementia and depression (http://1.usa.gov/1M2XJvY). The facts are in, a western diet rich in added sugar isn’t good for the brain and the negative biochemistry adds up over time to cause serious mental problems later in life. Even more disturbing, as the CDC report showed, kids are consuming high sugar diets during the period of rapid neuronal expansion and synapse formation, and they are eating most of this sugar at home. Sugar is very addictive, I grant you that, but perhaps we can strive to make a long and healthy life addictive instead.